In this Privacy Notice, when we refer to "we", "our", "us" or "UKPathway", we mean UKPathway Consultancy Group. If you have any questions about this Privacy Notice please contact us using the details in the "How to contact us" section below. 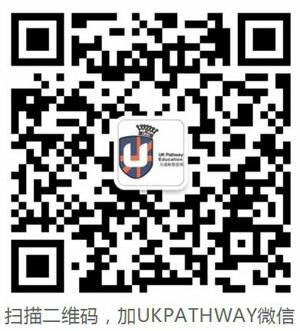 We may collect personal data from you when you buy or use our products or services, when you sign up to UKPathway newsletters or other subscription services, enter into offers or promotions, interact with us on social media platforms, contact us, make a complaint or use our Websites. The categories of personal data we may request include your name, occupation, contact information (email, postal address and phone/mobile number), credit card/payment details, passport details, and general information about you such as your experience with UKPathway services. We may also keep copies of any correspondence you send us which may include personal data. We also obtain some of your personal data by automated means, for example, when you visit our Websites we collect the IP address of the device you use to connect to the Internet, the geographical location of your device, the browser you are using, the type of device you are using (tablet, mobile, desktop), the URL you came from and the web pages you access. • We may request information about you from credit reference agencies and fraud prevention agencies to assist us in the provision of our goods and services to you. • We may sometimes purchase information about prospective customers from third party organisations for marketing purposes. We will always take steps to ensure that your personal data is only used for these purposes if you have consented to receive marketing materials from us. You can opt out from receiving our marketing communications at any time by following the instructions in any of the messages you receive. • We need to use your information to perform a contract with you or to fulfil a request originated by you. • You have given your consent to us using your information. • Using your information is in our legitimate business interests (provided these interests are balanced against your rights). • We need to process your personal data to comply with legal obligations to which we are subject. 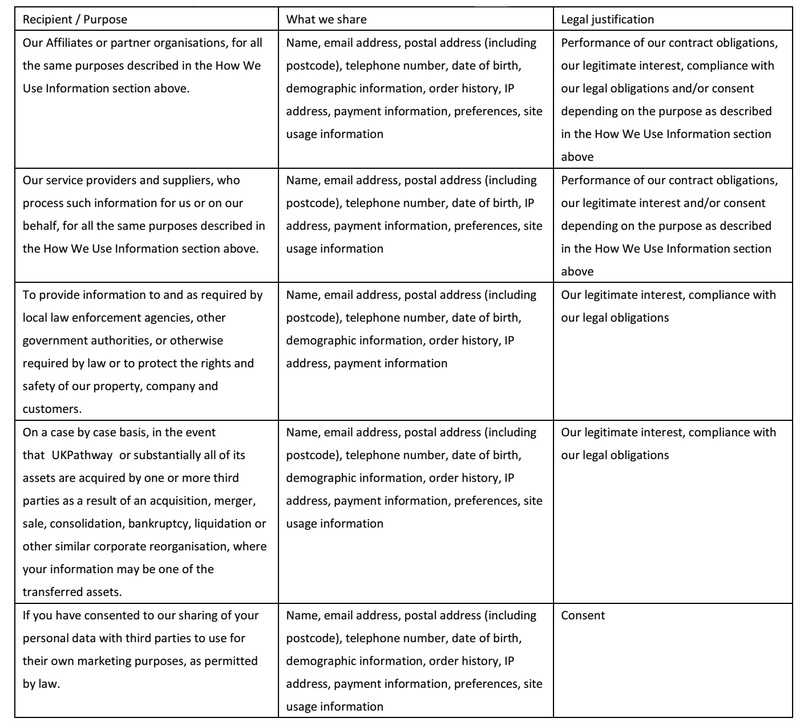 The information below sets out the different purposes for which we may use your personal data and the legal basis for each one. Note that the purposes for which we use your personal data may change from time to time, in which case we will update this privacy notice (see further "Updates to our Privacy Notice" below). Legal Basis - Performance of our contractual obligations, our legitimate interest, or your consent. Legal Basis - It is in our legitimate interests to process personal data to keep our customers' payments secure. We may need to process your personal data to comply with legal obligations binding or accepted by us. For example, we may need to retain your transaction records for a period of time to comply with tax or accounting requirements, or disclose your personal data if forming part of an investigation by law enforcement. Legal Basis - Compliance with our legal obligations. We use personal data (such as your name, email address, postal address (including postcode), telephone number, date of birth, order history, IP address, preferences, and site usage information) to better understand you and your preferences so that we can provide you with tailored offers and personalise your experience on our Websites. Legal Basis - Our legitimate interest, or your consent. We use your personal data to send you service-related communications about the service we are providing for you, for example to update you on any changes, or to request further information from you. Legal Basis - Performance of our contractual obligations, our legitimate interest or your consent. Legal Basis - Our legitimate interest or your consent. We may use your personal data to answer your service related queries and any other general enquiries you make. Legal Basis - Performance of our contractual obligations, or our legitimate interest. We use your personal data when we deal with complaints or other customer service issues, such as organising refunds. Legal Basis - Our legitimate interest. • Access. You have the right to request a copy of the personal data we are processing about you, which we will provide back to you in electronic form. For your own privacy and security, in our discretion we may require you to prove your identity before providing the requested information. If you require multiple copies of your personal data, we may charge a reasonable administration fee where we are permitted to do so in accordance with the GDPR. • Rectification. You have the right to have incomplete or inaccurate personal data that we process about you rectified. Note that you can always make certain adjustments to certain personal data directly through your online account. • Deletion.You have the right to request that we delete personal data that we process about you, except we are not obligated to do so if we need to retain such data in order to comply with a legal obligation or to establish, exercise or defend legal claims. • Restriction. You have the right to restrict our processing of your personal data where you believe such data to be inaccurate, our processing is unlawful or that we no longer need to process such data for a particular purpose, but where we are not able to delete the data due to a legal or other obligation or because you do not wish for us to delete it. • Portability. You have the right to obtain personal data we hold about you, in a structured, electronic format, and to transmit such data to another data controller, where this is (a) personal data which you have provided to us, and (b) if we are processing that data on the basis of your consent (such as for direct marketing communications) or to perform a contract with you. • Objection. Where the legal justification for our processing of your personal data is our legitimate interest, you have the right to object to such processing on grounds relating to your particular situation. We will abide by your request unless we have compelling legitimate grounds for the processing which override your interests and rights, or if we need to continue to process the data for the establishment, exercise or defence of a legal claim. · Withdrawing Consent. If you have consented to our processing of your personal data, you have the right to withdraw your consent at any time, free of charge. This includes cases where you wish to opt out from marketing messages that you receive from us. You can unsubscribe from marketing communications at any time by following the instructions in any individual message. The legality of the processing of your personal data prior to you withdrawing your consent remains unaffected by this. You can make any of these requests in relation to your personal data by submitting your request by contacting us by phone, e-mail or post using the details in the "How to contact us" section of this Privacy Notice.